Over the long Thanksgiving weekend, I had the pleasure of spending time with a friend who hails from Russia. 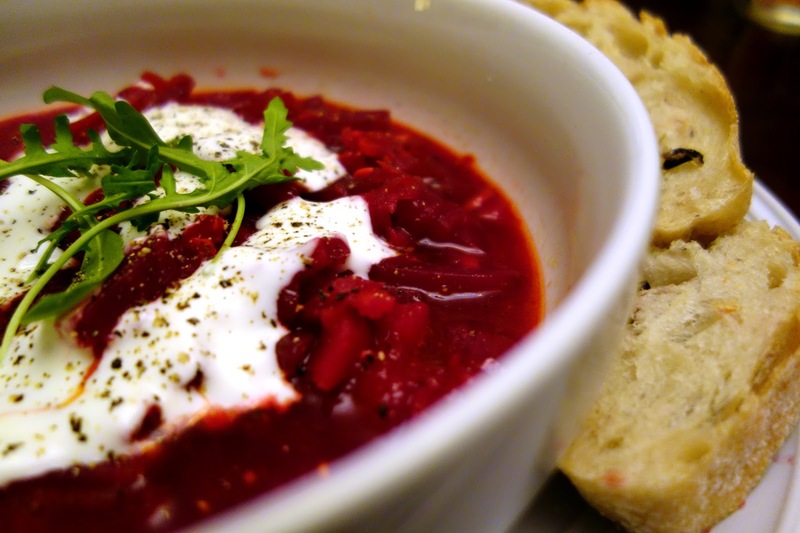 When I asked him about delicious vegetarian recipes from his homeland, he mentioned his mother’s borscht. He spoke of its richness and the deep color and said that there are two steps that make hers special. One is Zakvaska. To make it, grate 1/3 of the beets going into the soup, saute until very soft and dark with garlic and then add vinegar, bringing out and setting their color. This in turn is added to the soup towards the end of the cooking process and ensures the deep, vivid color of the final soup. The other step is to boil a couple of peeled potatoes into the broth, remove, mash and add back in to the soup. This ensures that the soup will have extra body and thickness. I helped him make this amazing vegan soup one cold Northern California evening, and then ate as much as I was allowed, and then was sad to see it go. The second time I made this soup I doubled the recipe and not even that lasted very long. This soup makes me feel like I am fortifying my blood. This is a two pan process. In a large soup pot, pour a few glugs of olive oil and heat until it begins to shimmer. Add the onions and cook for a few minutes. Then add the carrots and celery and cook for another few minutes until soft and beginning to caramelize. 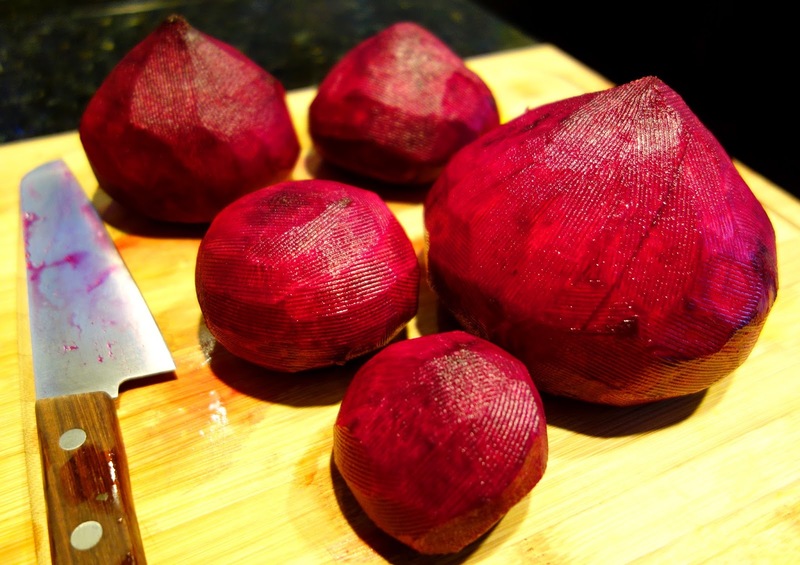 Add the julienned beets and cook until the beets begin to soften. Meanwhile, in a separate soup pot, put the broth (or water and bouillon cubes), cloves, pepper, bay leaves and potatoes. Simmer until the potatoes are soft and easy to pierce. Remove the potatoes and mash with a fork (or use a ricer like I did), and set aside. Pour the broth into the beets, carrots and celery, and add the diced tomatoes. Cover and simmer for 20 minutes. Now make the Zakvaska. While the soup is simmering, pour a bit more oil into the second pot and add the shredded beets with the remaining garlic. 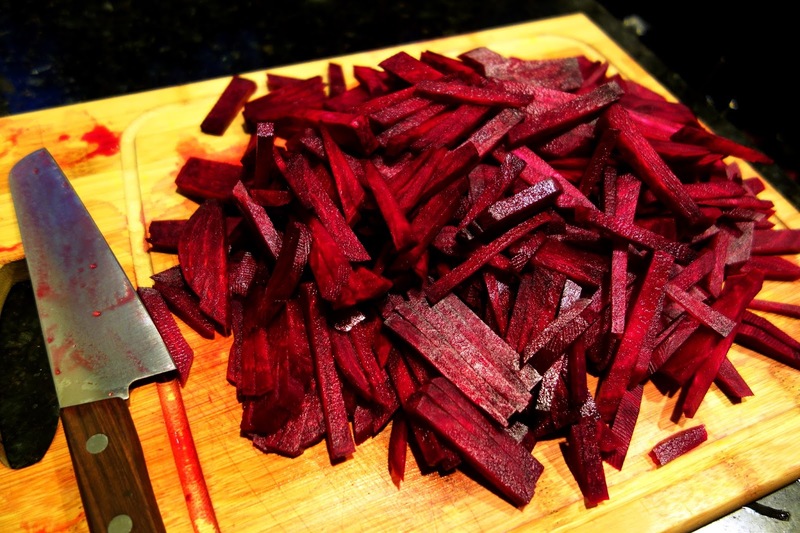 Cook over medium low heat until the beets are soft and dark in color, about 5–10 minutes. Once done, add the vinegar. Continue to heat and stir for a moment. This creates a delicious element that Pasha and I agree would be great as a stand alone condiment on bread or crackers. Once the soup has been simmering for 20 or so minutes, add the mashed potatoes along with the shredded beet/vinegar blend. Stir and continue to simmer for another 15-20 minutes. Taste and salt. Serve hot, with a dollop of yogurt, sour cream or vegan cashew sour cream. I am a lover of fresh herbs, so I felt it necessary to add a sprig or two to mine as garnish.